I feel like I missed most of the summer, and spent too long at a computer. I’m sure I’m not alone in that. Signifiers of the summer’s arrival are: the sound of swifts in screaming flight, and, in more recent years, the sound of steam trains on the Scarborough line. The swifts arrive in noisy jubilance in May. They’re city birds, a town-dweller’s equivalent of the swallows flying over fields. They fill the summer sky with their high-pitched calling. They leave in early August, migrating back, and I always think of lines from a Sylvia Plath poem – ‘The swans are gone. Still the river remembers how white they were’ … The swifts are gone. Still the sky remembers how noisy they were. While they’re up in the sky in screeching flight, they’re matched in vigour and summer-signifying down here on earth, by a sound at the other end of the scale, energy harnessed just the same, but deep and low as a sound can be, from the summer steam trains. All summer I’d heard them, but not got a photo. 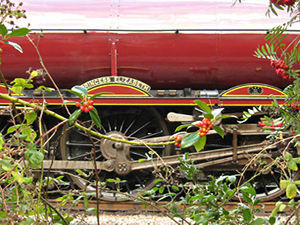 Or rather, I’d got these two photos, which are clearly rubbish, of ‘train almost visible through trackside vegetation’. I had letters I needed to get to the sorting office on Leeman Road for the day’s last collection. 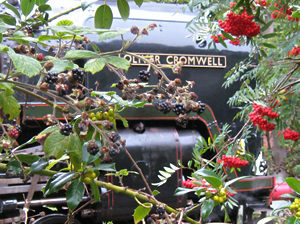 On the way I passed a steam train on the Scarborough line, stopped near Bootham, soon to head for the station. 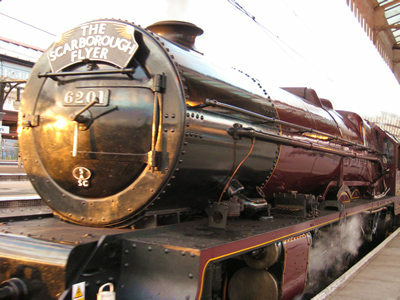 Its nameplate said ‘Princess Elizabeth’, on duty that day as ‘The Scarborough Flyer’. It was the last Friday of the school holidays. I thought the summer trains would be stopping soon. This might, indeed, be the last one. I should make a special effort, I thought – heading down Bootham Terrace, alongside the line, speeding up from my normally quite fast walking pace, until I was running. Running isn’t a normal activity for me, so the running soon gave way to a very fast ridiculously anxious-looking walk. I kept looking over my shoulder, thinking that ‘Princess Elizabeth’ might be hurtling past at any moment. By the time I got to Scarborough Bridge it really mattered to me that I got a photo, and I looked so anxious and stressed that people made way for me, assuming I needed to catch a train. Which I did, in a way. I ran up the new ramp to the station, which is long and zig-zagging. Stopped on the platform, gasping for breath. Got ready to take a photo. Then remembered my letters. Ran back down the long zig-zag, to the sorting office. Ran back up it again. Felt ready to collapse. Resumed my previous position, but this time leaning on the railings for support. The train came in, pulling in to a platform too far away, not quite the impressive vision I’d imagined. Took a deep breath and chased the train through the station. It had stopped at the other end. Smartly-dressed staff were standing by the carriage doors. A group were gathered, just to watch it, some taking photos. I caught my breath and slowed to a more normal pace. At the platform’s end, facing the last light of the day, kind people moved aside, and a woman said ‘It’s nice to have a photo of the front, isn’t it’. The evening sun shone on the station roof. The train began to move, children waved from the windows and we all waved back from the platform, as the Scarborough Flyer headed off into the sunset.